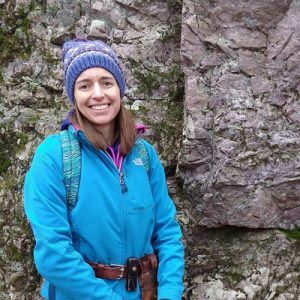 My research interests are focused on understanding Wisconsin’s oldest rocks—those that formed during Precambrian time, generally more than 800 million years ago. These rocks underlie all of Wisconsin and may be exposed at the land’s surface or buried by several hundred to over a thousand feet of younger rocks and glacial sediments. Though Wisconsin’s Precambrian rocks are hard to directly observe across much of the state, they control or have a significant impact on many of the state’s natural resources, including metallic and non-metallic mineral deposits, groundwater quantity and quality, geothermal energy potential, and potential carbon sequestration. 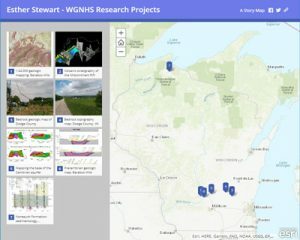 My primary goal as a scientist at the Wisconsin Geological and Natural History Survey is to develop research programs that improve our understanding of the distribution and variability of different kinds of Precambrian rocks—what Precambrian rocks underlie Wisconsin and how did they get there? Through constraining our understanding of Precambrian rocks and structures we can better understand their impact on the state’s natural resources. Stewart, E.D., K. Stewart, E., Walker, A., and Zambito IV, J. J., 2018, Revisiting the Paleoproterozoic Baraboo interval in southern Wisconsin: Evidence for syn-depositional tectonism along the south-central margin of Laurentia, Precambrian Research, v, 314, 221-239. Medaris, G.L., Driese, S.G., Stinchcomb, G.E., Fournelle, J.H., Lee, S., Xu, H., DiPietro, L., Gopon, P., K. Stewart, E., 2018, Anatomy of a sub-Cambrian paleosol in Wisconsin: Mass fluxes of chemical weathering and climatic conditions in North America during formation of the Cambrian Great Unconformity, The Journal of Geology, v 126, 261-283. Wellner, R..W., Varban, B.L. Roca, X., Flaum, J.A., K. Stewart, E., and Blum, M.D. 2018, Simple is better when it comes to sequence stratigraphy—the Clearwater Formation of the Mannville Group reinterpreted using a genetic body approach, AAPG Bulletin, v 12, 447-482. Stewart, E. and Mauk, J.L., 2017, Sedimentology, sequence stratigraphy, and geochemical variations in the Mesoproterozoic Nonesuch Formation, northern Wisconsin, USA, Precambrian Research, 294, 111-132. Kingsbury-Stewart, E.M., Osterhout, S.L., Link, P.K., and Dehler, C.M., 2013, Sequence stratigraphy and formalization of the Middle Uinta Mountain Group (Neoproterozoic), central Uinta Mountains, Utah: A closer look at the western Laurentian Seaway at ca. 750 Ma, Precambrian Research, 236, 65-84. Dehler, C.M., Fanning, C.M., Link, P.K., Kingsbury, E.M., and Rybczynski, D., 2010, Incipient Rodinia breakup, marine transgression, and peri-Gondwanan sediment source in western Laurentia at <766-742 Ma: New SHRIMP data from the Uinta Mountain Group and Big Cottonwood Formation, northern Utah: Geological Society of America Bulletin; v. 122; no. 9/10; p. 1686–1699. Stewart, E.D and K. Stewart, E., accepted pending minor revisions, geologic map of the North Freedom 7.5-minute quadrangle, Sauk County, Wisconsin, WGNHS map series, 1 plate scale 1:24,000. Osterhout, S.L.,. Link, P.K., and Dehler, C.M., and Kingsbury-Stewart, E.M., 2016, Geologic map of the Mount Powell 7.5-minute quadrangle, Duchesne and Summit counties, Utah: Utah Geological Survey Miscellaneous Publication 16-5, 2 plates, scale 1:24,000. Kingsbury-Stewart, E.M., Link, P.K., Osterhout, S.L., and Dehler, C.M., 2015, Geologic map of the Kings Peak 7.5-minute quadrangle, Duchesne and Summit counties, Utah: Utah Geological Survey Miscellaneous Publication 15-3DM, 2 plates, scale 1:24,000. Stewart, E., in preparation, Bedrock geology of Dodge County, Wisconsin, WGNHS map series, 2 plates, scale 1:100,000, anticipated completion 2019. Stewart, E., Rasmussen, J., Skalbeck, J., Brengman, L., and Gotkowitz, M., in preparation, Topography of the Precambrian surface underlying Columbia County, WI, WGNHS map series, 1 plate, scale 1:100,000, anticipated completion 2019. Stewart, E. and Stewart, E.D., in preparation, geologic map of the Baraboo 7.5-minute quadrangle, Sauk County, Wisconsin, WGNHS map series, 1 plate, scale 1:24,000, anticipated completion 2019. Stewart, E.D. and K. Stewart, E., in preparation, geologic map of the Rock Springs 7.5-minute quadrangle, Sauk County, Wisconsin, WGNHS map series, 1 plate, scale 1:24,000, anticipated completion 2020. 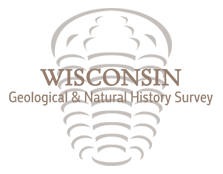 Stewart, E., in preparation, Mineral Resources and Severed Mineral Rights in Wisconsin, WGNHS open file report, anticipated completion 2020. Brengman, L.A., Stewart, E.K., Stewart, E.D., Moy, A., Fournelle, J.H., Segee-Wright, 2018, Reviving historical data >100 years later: A fresh look at the depositional setting and petrogenesis of the <1.71 Ga Freedom Formation, Baraboo, WI, Geological Society of America Abstracts with Program v. 50. Grauch, V.J.S., Stewart, E.K., Woodruff, L.G., Heller, S., 2018, Integrated geophysical modeling provides insights into the three-dimensional geometry of the Midcontinent Rift in Western Lake Superior, Geological Society of America Abstracts with Program v. 50. Grauch, V.J.S., Bedrosian, P.A., Stewart, E.K., and Heller, S., 2018, Inferences on the subsurface distribution of Oronto and Bayfield Groups North and West of the Douglas Fault, Northwestern Wisconsin, 64TH Institute on Lake Superior Geology Proceedings, V. 64, Part 1, Program and Abstracts, p. 42-43. Grauch, V.J.S., Woodruff, L.G., Stewart, E.K., 2018, Reverse fault or complex feeder zone? : Evaluating geophysical observations of the 1.1 Ga Midcontinent Rift from Isle Royale to Superior Shoal and broader geological implications for northern Lake Superior, Geological Society of America Abstracts with Program v. 50. *Rasmussen.J, Skalbeck, J., and Stewart, E. K., 2018, Modeling the Precambrian topography of Columbia County, Wisconsin using two-dimensional models of Gravity and Aeromagnetic data and Well Construction Reports, North Central Geological Society of America Abstracts with Program, v 50 . *Rasmussen, J., Stewart, E.K., Skalbeck, J., and Gotkowitz, M., 2018, Modeling the Precambrian topography of Columbia County, Wisconsin using two-dimensional models of gravity and aeromagnetic data and well construction reports, 64TH Institute on Lake Superior Geology Proceedings, V. 64, Part 1, Program and Abstracts, p. 83-84. Schwarts, J., Stewart, E.K., and Medaris, L.G., Jr., 2018, Detrital zircons in the Waterloo Quartzite, Wisconsin: Implications for the ages of deposition and folding of supermature quartzites in the southern Lake Superior Region, 64TH Institute on Lake Superior Geology Proceedings, V. 64, Part 1, Program and Abstracts, p. 93-94. Stewart, E.K., Grauch, V.J.S., Woodruff, L.G., Heller, S., 2018, Seismic stratigraphy of the 1.1 Ga Midcontinent Rift beneath western Lake Superior part I: Subsidence as a major driver on basin development (invited presentation), Geological Society of America Abstracts with Program v. 50. Stewart, E.K., Grauch, V.J.S., Woodruff, L.G., Heller, S., 2018, Seismic stratigraphy of the 1.1 Ga Midcontinent Rift beneath western Lake Superior part II: Evolution of rift-fill through time, Geological Society of America Abstracts with Program v. 50. Stewart, E.K., Roushar, K., Stewart, E.D., 2018, New bedrock geologic mapping, Dodge County, WI, Geologic Mapping Forum 2018 Abstracts, Minnesota Geological Survey Open File Report OFR-18-2, P. 77-78. Stewart, E.K., Stewart, E.D., and Roushar, K., 2018, New bedrock geologic mapping of Dodge County, Wisconsin provides evidence for Paleozoic reactivation of Precambrian structures, 64TH Institute on Lake Superior Geology Proceedings, V. 64, Part 1, Program and Abstracts, p. 101-102. Stewart, E.K, Skalbeck, J., Rasmussen, J., Gotkowitz, M., Brengman, L., and Segee-Wright, G., 2018, Developing a geologic framework for aquifer geometry through modeling of gravity and aeromagnetic data, American Water Resources Association Wisconsin Section Annual Meeting, Appleton, WI. Woodruff, L.G., Grauch, V.J.S., Stewart, E.K., Schulz, K.J., and Nicholson, S.W., 2018, Diverse feeder sources for the Portage Lake Volcanics, Midcontinent Rift system (invited presentation), Geological Society of America Abstracts with Program v. 50. Kingsbury Stewart, E., and Stewart, E.D., 2017, New Precambrian geologic mapping of the Baraboo Hills, southern Wisconsin constrains Baraboo-interval sedimentation and deformation: Institute on Lake Superior Geology Program and Abstracts, v. 63, p. 50-51. *Sanger, M., Kingsbury Stewart, E., and Grauch, V.J.S., 2017, Seismic interpretation of the 1.1 Ga Midcontinent Rift volcanic interval beneath Lake Superior: Institute on Lake Superior Geology Program and Abstracts, v. 63, p. 79-80. Grauch, V.J.S., Sanger, M., Anderson, E.D., and Kingsbury Stewart, E., 2017, Revisiting geophysical interpretations of the Midcontinent Rift below Lake Superior: Institute on Lake Superior Geology Program and Abstracts, v. 63, p. 36–37. Kingsbury Stewart, E., and Mauk, J.L., 2016, Sequence stratigraphy and basin evolution of the Mesoproterozoic Nonesuch Formation, Ashland Syncline, northern Wisconsin: Institute on Lake Superior Geology Program and Abstracts, v. 62, p. 141–142. Kingsbury Stewart, E., Stewart, E.D., and Lamb, M., 2016, Discovering hidden folds and faults in the Precambrian: New insights into Baraboo-interval stratigraphy and deformation in southern Wisconsin: Institute on Lake Superior Geology Program and Abstracts, v. 62, p. 143–144. *Lamb, M.T., and Kingsbury Stewart, E., 2016, A comparison of Baraboo-interval (Late Paleoproterozoic) iron-formation, southern Wisconsin: Institute on Lake Superior Geology Program and Abstracts, v. 62, p. 85–86. *Guenther, G., and Kingsbury Stewart, E., 2016, Paleocurrent interpretation of the Cambrian Elk Mound Group using geophysical optical borehole image (OBI) logs from two new boreholes, Dodge County, southern Wisconsin: Institute on Lake Superior Geology Program and Abstracts, v. 62, p.58–59. Stewart, E.K., Havholm, K.G., Galston, L., Zambito, J.J., IV, and Dehler, C.M., 2015, Microbially induced sedimentary structures and large sand stromatolites in the terrestrial and marine/lacustrine-transitional Bayfield Group (Proterozoic), Wisconsin: Geological Society of America Abstracts with Programs, North-Central Section, v. 47, p. 28. Stewart, E.K., DeBruyne, J., Zambito, J.J., IV, McLaughlin, P.I., and Dehler, C.M., 2015, New detrital zircon age data from Baraboo interval quartzites, southern Wisconsin: Geological Society of America Abstracts with Programs, North-Central Section, v. 47, p. 2. Link, P.K., Stewart, E.K., Dehler, C.M., and Osterhout, S.L., 2015, Neoproterozoic transcontinental rivers and a possible Jacobsville/Bayfield Group—Uinta Mountain Group connection: Geological Society of America Abstracts with Programs, North-Central Section, v. 47, p. 28. Stewart, E.K., Streiff, C.M., Rawling, J.E., III, and Hart, D.J., 2015, Beyond the sandbox: a geological approach to characterizing hydrostratigraphic variability in the Central Sands of Wisconsin: American Water Resources Association Wisconsin Section Annual Meeting, Oconomowoc, WI. Stewart, E., Zambito, J., McLaughlin, P., Gotkowitz, M., 2014, Geologic mapping of Columbia County: 3-D subsurface reconstruction using an integrated geological dataset: AWRA abstract.